Tofu is one of my favourite ingredients in Chinese cooking. 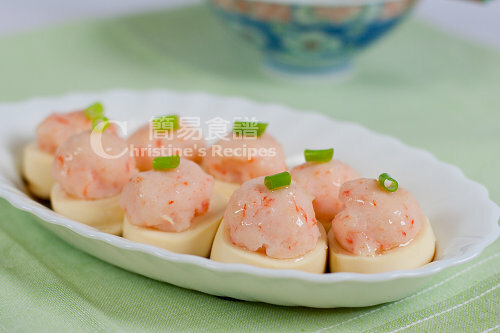 Although it’s cheap and common, it could be served in an elegant way to impress my family and friends, just by adding a bit of prawn/shrimp meat paste. 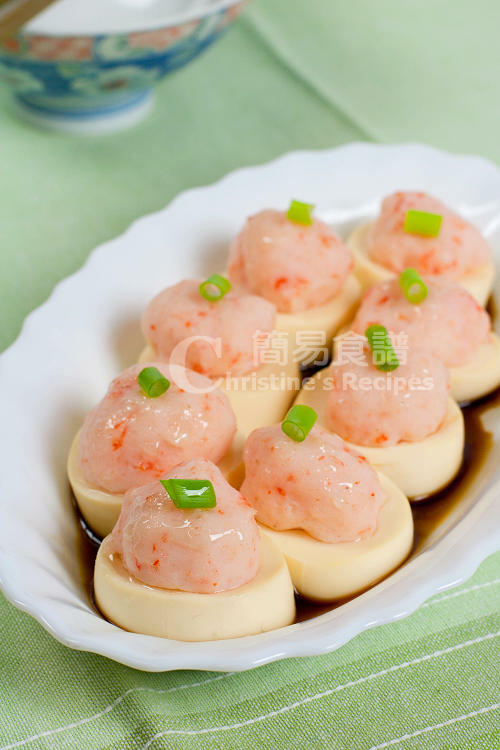 Every time I have this dish, I love taking a close look at the springy prawn ball sitting on top of the silky smooth tofu before taking a big bite. It’s an incredible feeling that you can feel all the flavours bursting out in your mouth at the moment you bite them. This is the silky tofu I used. You'd easily find it available at any Asian grocers. Normally this kind of products are stored in fridge. The texture is so delicate and smooth. I used a food processor to make the prawn (shrimp) paste. Mix it with the marinade and give it a good stir before steaming with tofo. This dish took less than 10 minutes to steam in a wok or a steamer. We couldn't wait to dig in once the dish was served on the dining table. Peel and devein the prawns. Rinse thoroughly and wipe dry with kitchen paper (as picture shown). 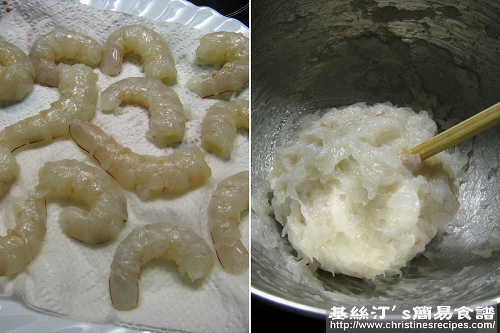 In a food processor, put the prawn and marinade to process into a thick paste. If you want springy texture, transfer it into a mixing bowl, stirring with chop sticks towards one direction, either clockwise or anti-clockwise, until you feel it's really hard to stir further. Wet your hand with a bit of water, then pick up the prawn paste and throw against the bottom of mixing bowl many many times until the paste attains that springy texture. 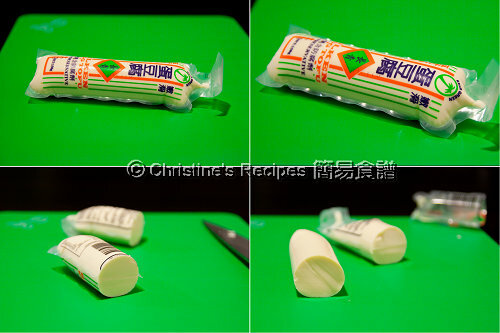 Following the instructions of the package, remove the silky tofu from the packing. Cut the tofu into about 1.5 to 2cm thick pieces. Carefully place the tofu on a plate. Absorb excess water with kitchen paper. Lightly sprinkle cornflour on the surface of the tofu. 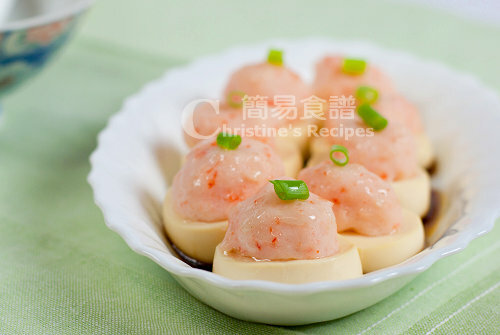 Spoon prawn paste and arrange on the tofu. Steam in a wok/steamer over high heat for about 6 to 8 minutes, or until the prawn paste is cooked through, changed into red in colour. Discard any excess water in the plate. Drizzle with seasonings. Serve hot. Yummy and so pretty. They look like dim sum food. I will make these one day because they seem like it is easy enough for me. Thank you for sharing this recipe! Lovely, just like dim sum! I just bought some tofu for tomorrow's lunch. Maybe I'll do something like that. I am so making this.. thanks for my weekend dish. Nice presentation, I love this. Actually I had one posted as early as I started blogging : ). These looks light, pretty and delicious. My children love these silky tofu, cooked in any way. Thanks for such an awesome recipe! This is just like restaurant serving dish, looks so pretty and delicious! This reminds me of Chinese jade and pearls...they look gorgeous! ohhhh yummie yummie :D Can I ask- if I don't like prawns what can I make it with? made this today. so easy and yummy. thumbs up from everyone around the table. thanks heaps!!! I have added broccoli around the edges for presentation. Thanks for sharing this recipe. I didnt realise how easy it was to make the paste. Gorgeous, decorated this dish with broccoli. I always have trouble making the shrimp paste, does it make a difference if I use fresh or frozen shrimp? Very good. Very easy. Thank you. I am a fan. If I don't have silky tofu, can I use firm tofu? Can I use corn starch instead of corn flour? They are the same thing. We call it corn flour in Australia, but corn starch in US. Great recipe! I followed the steps and the dish turned out exactly like the picture. My husband loved it. 10 out of 10!!! Awesome! Great to know your husband loved it. Congrats on your success! Thank you for sharing this recipe. I can't wait to try it! Light soy sauce (生抽) is light in colour, compared to dark soy sauce (老抽). The saltiness and taste vary from brand to brand. I do not have a food processor. Can I use a blender instead to work on the shrimps? Sure you can. My mother-in-law doesn't have a food processor too. She only uses a cleaver to finely chop the shrimp, then mix with marinade to make a paste.